This stage features slick surfaces that will let you start sliding and keep you sliding right into enemies. There fortunately aren't too terribly many pits to worry about, but there are other enemies and obstacles that can make your trek difficult. 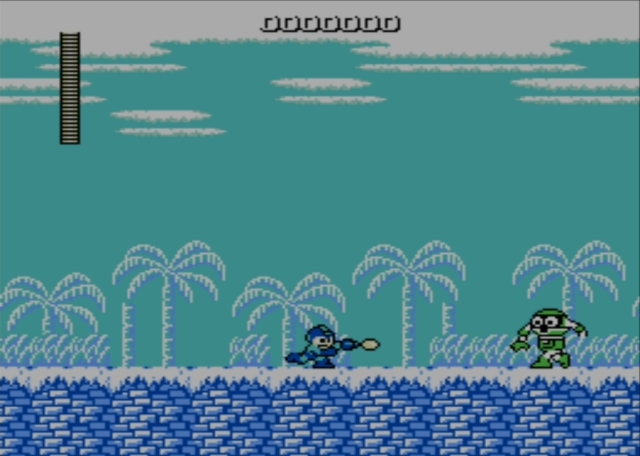 The gangly green enemies that rush you as you enter this stage appear more imposing than they actually are. Just a few shots from your arm cannons will dispatch each one, and they seem to drop generally nice loot. Mingled with the green fellows are similarly fragile flying birds, and those also may leave nice items to mark their demise. Blast as you go, ascending ice-slicked ledges until you arrive finally at a pool of water. Take the plunge and start to the right, noting that your leaps carry you further when water is involved. That's not something that plays into this game much, outside of a couple of sequences, but it becomes important in later games. 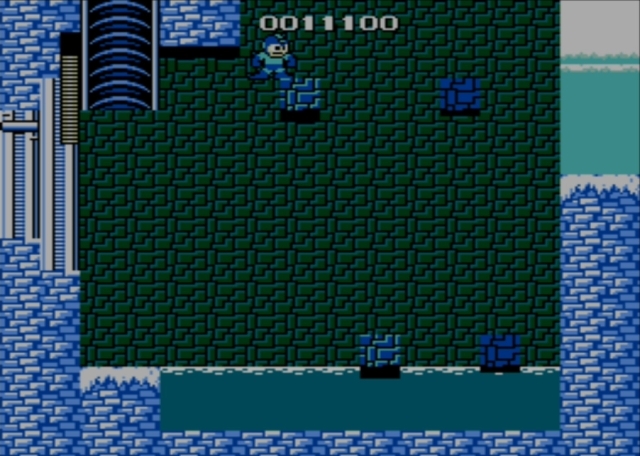 Mind the sliding enemy that patrols between two short columns as you start to the right while underwater. 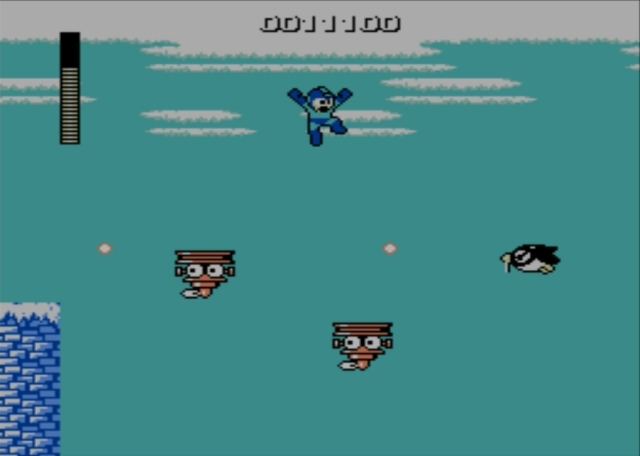 There are a few more like him, also appearing between columns, and you'll find more of the flying (now swimming) birds you can quickly blast out of your way. As you reach the far side of the area, you can drop down through an opening and blast some orange, sponge-covered enemies in a nook to the left. They're not much of a threat, and they guard an energy capsule you might need if a few enemies managed to catch you by surprise. Then you can return to the right and drop down the ribbed chute into a room that can be a real pain. If you've been following this guide from the start, you have already encountered some disappearing/reappearing blocks. In this stage, though, they are more deviously placed. 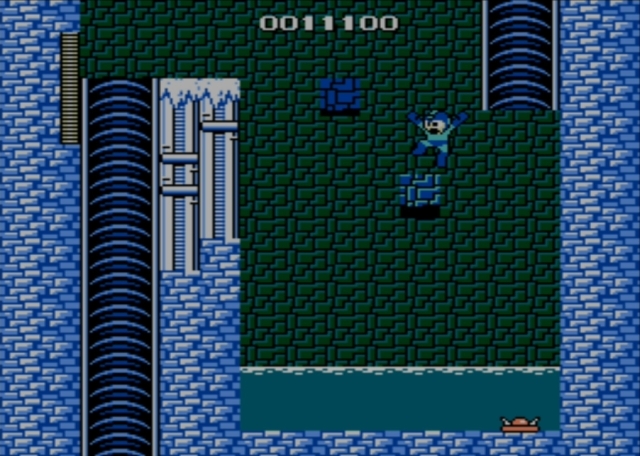 They rest above a pool of water with one of those sliding enemies patrolling, so if you make a mistake, you fall into the soup and might take damage before you have the chance to jump out again to (temporary solid ground). 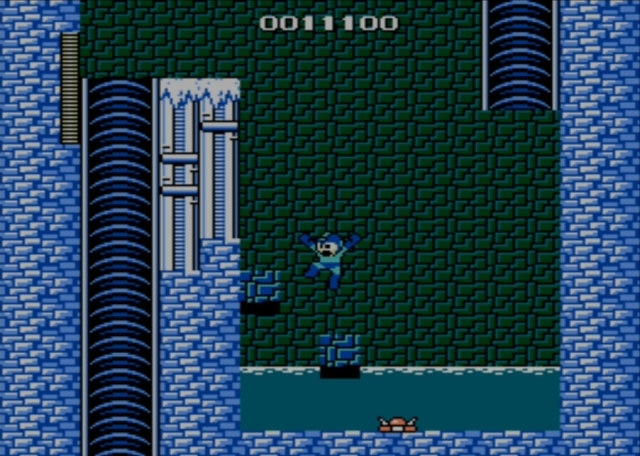 The pattern to follow is to jump onto the block that appears just about even with the water line, not far from the left wall. 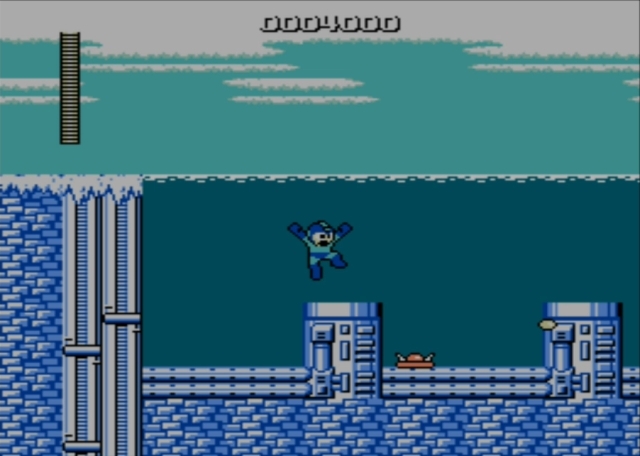 Then jump right to a block that appears in that direction, slightly higher from the water and just left from where the chute deposited you in the room. The next block is to the right, against the wall. 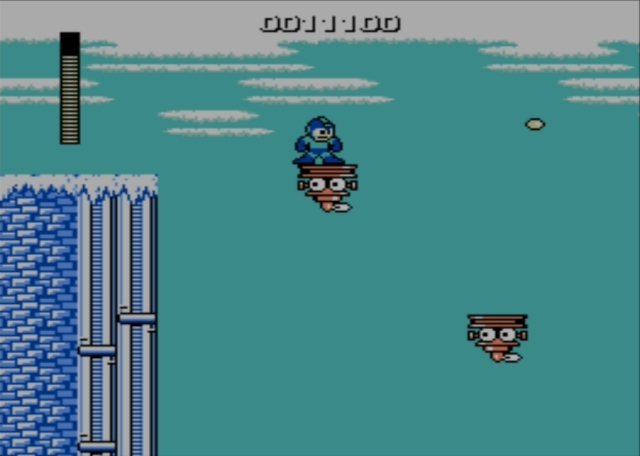 Then from there, you can jump to the upper left, and then make a high leap to the left again. 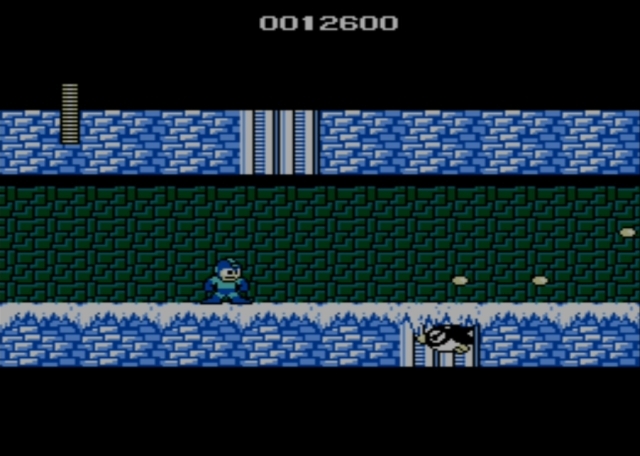 That last jump brings you even with the ledge to your left, so you can jump to it and drop down the next chute, located along the room's left side. Congratulations are in order, as you cleared a room of disappearing/reappearing blocks, but those accolades come with the gift of bad news: now you have to clear a second and even more difficult set of blocks. You can make things easier by causing the sliding trap robot to do a disappearing act of his own. As it veers toward the left, you should head right and hug the wall. Sometimes, if an enemy disappears off the side of the screen at the right moment, the game forgets it was even there and it won't return. If you can make that happen here, you'll have more luxury to mess around learning the pattern of jumps needed to proceed. 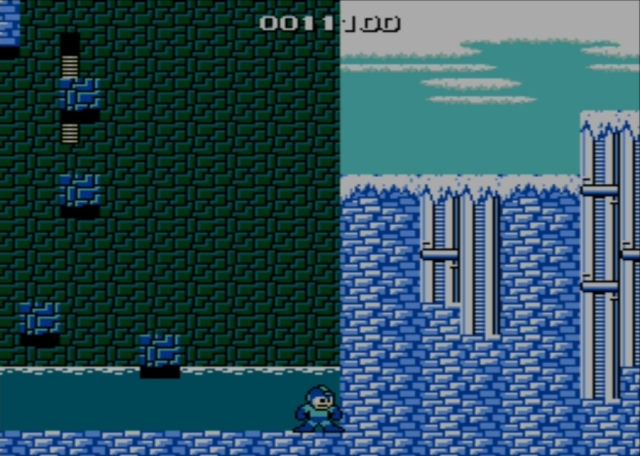 That pattern ultimately will find you starting near the lower right side of the screen, where once again a block appears just about even with the surface of the water. Hop onto it, then left to a slightly higher block, then left to a block just a tiny distance to the left, then make a long leap to one that appears to the left. From there, jump back to the right a little bit, then straight up and follow that up with a long jump to the right. From there, you can finally leap to solid ground near the upper right side of the screen. Whew! As you proceed to the right, you'll no doubt be less than pleased to discover that the next hazard is a wide abyss, meaning a simple mistake can easily wipe away that hard-fought progress. 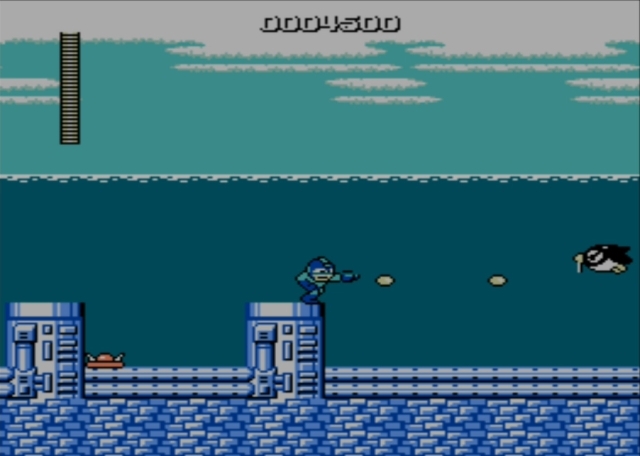 In this case, enemies are floating around. They look like inverted cones with propeller blades at their base and eyeballs on their front. Periodically, they fire shots to either side. You can ride on them, though, and so you must in order to proceed. Hop onto the first one and ride to the right. From there, you need to be ready to leap to a few more of the flying enemies. Be careful that you don't leap into the path of some horizontally-fired bullets, and that you don't let one shoot you off from a distance. You need to time your jumps carefully, as you cross a first pit that is then followed by a second wide pit. 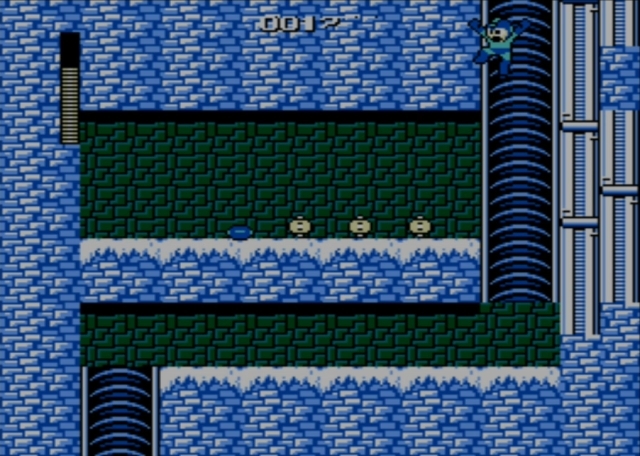 As you try to cross the second pit, you also must deal with flying bird enemies. Fortunately, solid ground awaits on the far side of that pit. You can even grab a 1-up icon by veering left as you drop down the chute. Make sure to veer left as you drop into the next screen, where you can find energy of various sorts resting on the upper ledge. Then drop down and head left to another chute you can descend into the next corridor. Here, you are greeted by a red, armored guardian that (as you likely recall from past meetings) does a lot of damage. You definitely want to run under him and keep moving if possible, as you can then reach a gate leading to a safer hallway. Here, birds fly toward you as you proceed, but you can blast them for energy drops and maybe even put yourself in good shape for the boss encounter that waits through the next door. If you've come prepared with the right weapon, this is one of the easiest encounters in the game. Simply equip your electrical beam you gained from defeating Electric Man. Three direct hits will take him down before he has a chance to use any of his powerful attacks. 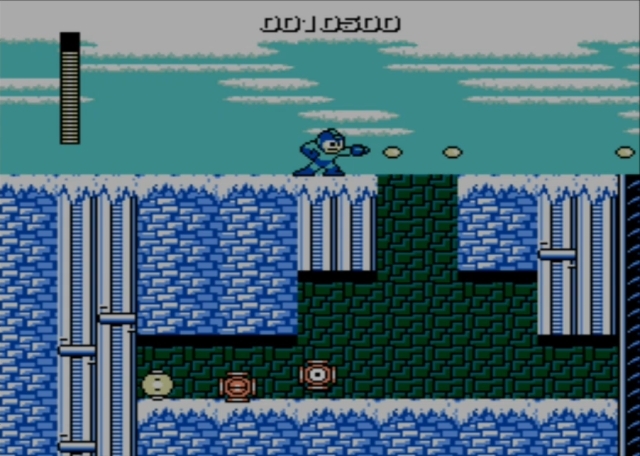 Otherwise, you should look forward to dodging a series of icy blasts while you return fire with your arm cannon. But why go through that trouble when you don't have to?